Goldwork & Silk Medallion: On the Edge! As mentioned earlier this week, I’ll be updating the Medallion Embroidery Project in larger chunks now, showing you progress on whole parts, rather than individual tiny elements. Why? Because from here on out, it gets a little repetitive! Don’t worry – I’ll still include close ups and those inevitable Instructional Moments (i.e. especially when I make mistakes, change my mind, run into trouble, and so forth!). Today, I want to show you the edge of the Medallion all stitched in, so you can get a general idea of the whole look of the piece now. Remember that the outer edge is embroidered in stem stitch filling, which is essentially just rows of stem stitch worked close together. I used three colors of blue, from darkest, to dark, to medium for the filling. You can see the finished gold dots on the edge – they don’t stand out quite as much as the white, empty dots, do they? But on the other hand, they stand out more, because they are dark and filled. Don’t worry – that will all come together when the rest of the filling is finished. There’s a lot of gold that still needs to be added to this! I’ve taken these photos from the side, with bright light on the project, so that you can see that the background behind the monogram can look actually very light, depending on the angle from which it is viewed and the lighting. If the lighting is dim and indirect, it tends to pick up the gold, making the background look like a fairly solid gold background. If the light is bright and direct, then it reflects off the silk behind the gold, and the background looks much lighter. See what I mean? It’s hard to believe what a difference the direction of the lighting and the intensity of the lighting can make on the look of the background! Perhaps seeing the piece on the frame like this also gives you a better sense of its size. The whole finished circle is 9″ in diameter. 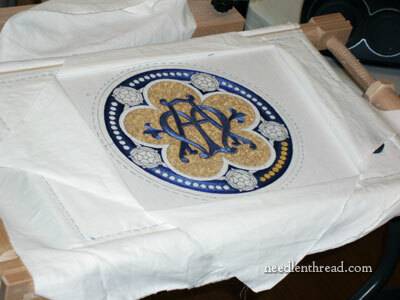 So you see that the project isn’t really “large” – but when it comes to this type of stitching, it sure seems large! And right now, the whole project is looking all blue-gold-white, isn’t it? Don’t forget that the Tudor-style roses will be embroidered in red silk! 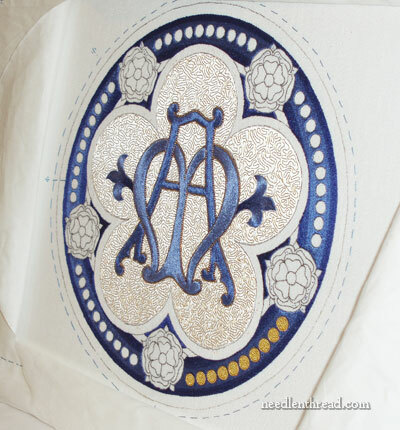 And some of the goldwork around the inner petal shape behind the monogram will be touched with red as well. Yesterday, I ran into a wall while stitching, and it brought everything to a grinding halt. I’ll show you the problem, as well as my solution… when I finally find the solution. I had to step away from the project a bit, waiting for inspiration to strike. At the moment, the Muses are mute. But more on that later! We’re floating around 260 hours right now. I estimate another 100-ish. We’ll see! Any questions, comments, or suggestions? Feel free to leave a comment below! If you’d like to read the back story on this project and follow along with it step by step, you are welcome to check out all the articles related to the Medallion project, which are listed in this Medallion Project Index. It looks fabulous Mary. I am awestruck. I like seeing it as a whole piece, especially the frame and the protective fabric. Hi Mary, it really does look magnificant! Oh those blank walls, they can be so frustrating. If you care to share your ‘problem’ perhaps one of use might be able to give your muses a nudge to wake them up! Hope you find the solution soon and can continue to progress. Lovely! Love seeing the whole piece-in-progress. You mentioned your hours. How do you keep track? A notebook? or a spreadsheet? or just gut feelings? It’s amazing how much different the light angles make. It’s like 2 completely different pieces! I have been following your work on the Alpha and Omega medallion and have really been enjoying the journey, even the setbacks. I have learned an awful lot about embroidery through this project and for that I thank you. I am curious as to what the ultimate goal is for this piece, i.e. where will it wind up? On an ecclesiastical garment? Altar frontal? Hi, Karen – thanks for your comment. Just to clarify for everyone’s sake, this isn’t the Alpha /Omega symbol. The rounded letter, you see, is an M, not the broken footed O that represents the omega in Greek. Also, the fleur de lys on the sides indicate that it is not, either, as they do not normally accompany a symbol of Christ, but more often a symbol of the Blessed Virgin. The whole piece, actually, is Marian in symbolism, as requested by the ordinand. The roses are symbolic of the Mistical Rose, a title of the Blessed Virgin, and the 10 dots in each section, totalling 50, represent the rosary, a Marian prayer. And then, of course, there’s all the blue. A symbol of Christ would not normally be worked predominantly in blue. So that’s the symbolism of the piece. 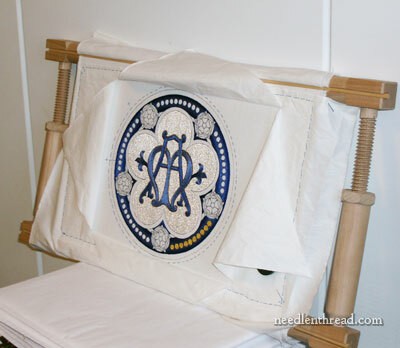 It was commissioned for the back of an ordination vestment, Roman in style. Hope that helps! Mary: Thank you for the explanation of the symbolism – I too assumed it was the “from Alpha to Omega” image. I was surprised to read it is only 9″ in diameter – it seems so much bigger in my imagination. I am all too familiar with the “uh oh, this isn’t going to work” feeling and the relief when a possible solution suddenly pops into your head after you’ve walked away for a while. If inspiration doesn’t strike soon and your deadline looms ever closer, please post the problem and see what responses you trigger. Janet. Mary: Thank you for the explanation of the symbolism! Truly beautiful (and meaningful) work. This special piece is going to be treasured for a long (long!) time. G’day Mary, seeing the whole like that and knowing it’s only 9″ in diameter sure puts a conceivable size to it, and makes it all the more impressive too. And the lighting difference to the background is magical. I love that vermicelli goldwork technique, couching down the meandering thread. It’s one of the things about goldwork that really appeals to me now. The effectiveness of the thread laid underneath it too. I should have put things like that in my Giveaway comment instead of prattling about past conscience hiccups. Awesome, Mary! I can’t wait till the roses start blooming!! what contrast that will be. I applaud your patience, especially with all those gold dots….and how do you track your time? Your ambition and determination in this endeavor is remarkable and extraordinary. Kudos to you! You’ve won my respect. When I get “stuck” on a project I generally shut everything down, get up, leave the room and close the door behind me. Then I go out and I “smell some daisies”. BREATH and appreciate what abounds around us. It generally gives you a whole new prospective on things and renews. Can’t hurt. Complicated project and how to determine a fair price for the artistry and labor! Between 400 and 500 hours at a living wage is a huge chunk of money for the back of a vestment, and all I can think of when setting a price for my work is that I’d personally never actually pay that much for something, if I wanted it I’d just make it for myself or do without. It’s silly but I actually feel guilty for taking people’s money for my work (not stitch work). Now this is a piece of art par excellence, but however do you estimate the amount of time it will take so you can come up with a fair price? Heck, looks like my whole post disappeared! This is so incredibly beautiful! I absolutely love hearing updates on this project. No one will ever completely appreciate the amount of work and the artistry that you’ve put into this piece – except maybe those of us who’ve had the privilege of watching your progress. But I guess that’s part of hand stitchery, isn’t it? I hope that you’re finding great satisfaction in this work. Nancy, very well said. Exactly. It’s great to see the ‘big picture. Isn’t it mind boggling to imagine who much hand work was done in the Renaissance, before and after. The tapestry, those beautiful clothes that wealthy people wore. And how were they kept clean? And how did they do it without electric lighting…. Thanks so much for letting us all see the project. It’s nice to know that there are a few people in the world who can still do it. Can you explain what the symbolism is in the project. What was your design process. A beautiful design and an amazing piece of silk and goldwork. I look forward to seeing all of the progress. Thank you for sharing with us. LOVE the pictures you took, Mary! Amazing that the lighting makes such a difference in how the work looks. What beautiful work you are doing! Your work is beautiful. I am encouraged to be as thoughtful and careful in my art as you are in yours. You are an inspiration, thank you. 9 inches – I was thinking it was 24 or 30 – all those tiny tiny stitches – I am gobsmacked. a cliff hanger. waiting with anticipation to find out what stalls you! What will you do with the medallion when it is completed? I did not realize your project was only 9 “. It looks huge. It is really beautiful, I would never attempt it, but it is interesting to read your updates and see how you have figured out problems. The problems can apply to many different projects, not just gold work. I hope you are getting paid a lot of money for this, as it is fantastic, beautiful and sooooooo much time. Thanks for sharing with us. I can’t wait for those gorgeous flowers to be done. Have a great weekend. Wow – awesome work! I love the photos, showing the whole project – and what a difference the lighting makes! I love how the shades change, depending upon the angle and lighting – very beautiful! Thank you so much, Mary, for sharing your embroidery knowledge and enthusiasm with us – it really is appreciated by so many! Mary, will the same effect of more white, more gold happen when it is being worn and moving through different light? It would look so alive if it does. How gorgeous! Hi, Phyllis – yes, you’re right. In different light, or when movement occurs, the change in the way the gold shows uo will be evident…. Mary, it’s breathtaking! I can’t imagine how beautiful it must be in person. It looks breathtaking! I really love how the silver thread reflects the gold spaghetti like stitching. I wonder if in your search for religious embroidery themes if you have come across any judaica ones? The Torah mantels that I’ve come across are machine stitched and quite pricey. I love seeing the progress. Yes, it seems big when you are working on it, but seeing the progress gives me hope for my projects! Thanks for letting me participate in this project. Absolutely beautiful! I can’t wait to see it finalized. I would love to do the same. Mary, this is so beautiful! Thank you for showing the whole piece on the frame. It looks like it is quite large, so I was quite surprised to read that it is only 9 inches. Good luck! Love watching you stitch this piece. You do wonderful work! magnifique chaque fois que je viens sur le site je trouve vos réalisations superbe , moi qui ne suis que débutante j’ai envie de continuer. Mary, the time, love and patience put into this masterpiece, not to mention the talent is out of this world. The change in the background from the lighting is amazing. It looks lovely both ways. I hope inspiration visits you today. My journey with embroidery has just begun. Every aspect is new to me. Your site is a Godsend. Thank you so much for sharing your inner thoughts, discoveries, and problem solving. It’s a huge help. Your work is absolutely beautiful! Stunning project and I loved your Tudor Rose when you posted it. Look forward to seeing the Tudor Roses done. Mary, If ever there was a project that merits your real gold thread, the Medallion is it. I think the medallion is the most perfect example of embroidery I have ever seen (and the blue is my favorite color too so that makes it more perfect). I wish I lived close by so I could call you and come over to see in person your work. The photos you post are really good – we can see everything, but to see it ‘for real’ would be great. The down side is that your work makes me feel like I just started to learn yesterday… sigh. Upside is I have something to which to aspire. The project is stunning even thus far. I am enjoying following every step and can hardly wait to see the completed masterpiece. does the medallion project come in a cross stitch pattern? Hi, Mary Jo – no, I’m afraid it doesn’t. It’s surface embroidery…. J’aimerais connaitre à quel siècle se rapporte le Marian Médaillon, récemment nous avons trouvé dans des archives ecclésiastiques un médaillon semblable. Cependant une petite différence : une couronne le surmonte et des fleurs de lys l’entoure. Peut-être tout simplement vous l’avez inventé? Yes, I designed this pattern, using various elements that have a little historical background – like the monogram in the center, which originally came from a book of ecclesiastical patterns from the late 1800’s. I altered it slightly for my designs. The roses are similar to Tudor roses, which have been around as design elements for centuries, though the color layout is opposite. The whole setting and execution is my invention. Previous Previous post: Goldwork Embroidery by Mary Brown – Book Give-Away! Next Next post: Goldwork Embroidery Book Winner!